pro forma portfolio & risk properties. your portfolio construction and avoid undesirable risk properties. credit risk am I taking? be the change in momentum factor? from my foreign stocks in the last 3 years? will be the decrease in duration risk? from my shorts on a market decline? Undesirable risk concentrations should be addressed. 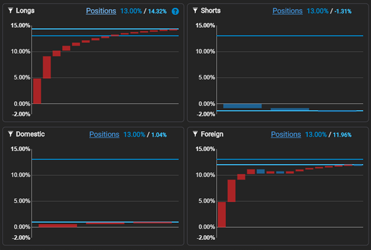 Risk attribution reports will flag when you are expressing the same bet multiple times, when you have too much risk on shorts, on specific sectors and so on. Visualize correlation effects that are hard to estimate using simpler exposure analysis. Knowing the "drivers" of portfolio risk is critical. Some amount of risk is inherent to the securities themselves and can be diversified away and some is the result of systematic sources and cannot. 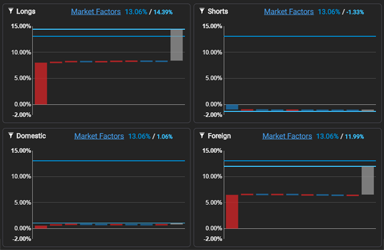 Factor reports will help you gauge systematic/idiosyncratic sources, allowing for better portfolio construction. 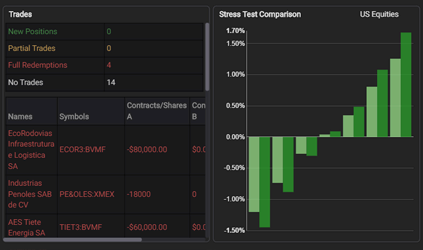 Stress test reports will analyze the expected behavior of your portfolio under extreme scenarios. When markets are under pressure, volatility and correlations tend to increase, potentially causing large profit and loss swings. It is critical for money managers to be prepared for those scenarios. This module is designed to flag any undesirable risk concentrations. It contains templates that will help you maintain a well diversified portfolio and avoid too much risk allocated to a specific sector, country, security type, shorts and various other criteria. 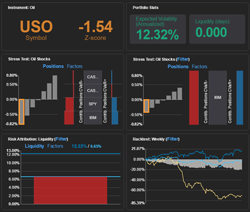 Understand bottom-up risk concentrations from positions, GICS sectors, countries, market capitalization, liquidity, implied rating, duration, dividend yield buckets and user-defined labels. 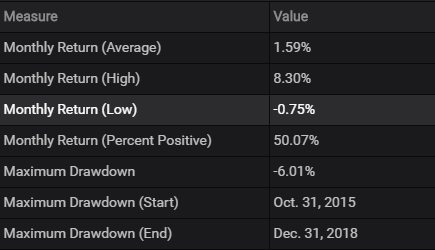 Break down risk concentrations attributed to: longs vs. shorts, domestic vs. foreign securities, options vs. non-options and fixed income vs. other securities. 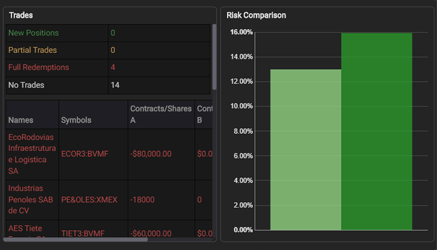 Verify the trades between 2 portfolio snapshots and plot their risk side by side. Risk can be customized to show: predictive volatility, Value-At-Risk and Conditional Value-at-Risk. This module helps you gauge the amount of various systematic and idiosyncratic risks in your portfolio. These top-down measures are critical when your portfolio contains funds and ETFs. Establish the amount of systematic and idiosyncratic risks under various factor models, such as: macro factors, GICS sectors, risk premia (value, momentum, quality and low volatility), value+growth, US bonds and global bonds. Establish the amount of systematic and idiosyncratic risks under a selected factor model, attributed to: longs vs. shorts, domestic vs. foreign securities, options vs. non-options and fixed income vs. other securities. 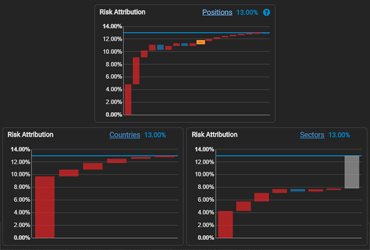 Visualize the amount of systematic and idiosyncratic risks for two superimposed portfolios under a selected factor model. Evaluate the trades that might have contributed to those factor changes. This module forecasts the behavior of the portfolio under extreme market conditions. Our stress test templates capture the increase in volatility and correlations that tend to occur when markets are under pressure. Gauge if your portfolio is ready to withstand unfavorable scenarios. Inspect the portfolio's forward-looking profit and loss (P&L) under various 10% up/down moves on: US equities, oil, Euro, treasuries and others. 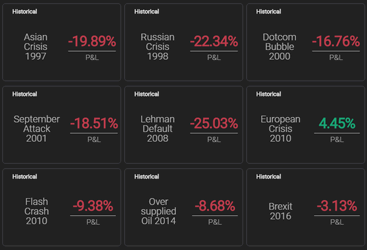 Understand your portfolio's expected profit and loss (P&L) under extreme market conditions from historical events, such as: Asian Crisis 1997, Russian Crisis 1998, Dotcom Bubble 2000, September Attack 2001, Lehman Default 2008, European Crisis 2010, Flash Crash 2010, Oversupplied Oil 2014 and Brexit 2016. Visualize your portfolio's expected and "tail" P&L under selected exogenous shocks. Break down contributions from positions, security types, sectors, countries-of-risk, liquidity, market capitalization, customized labels, implied rating, duration and dividend yield buckets. 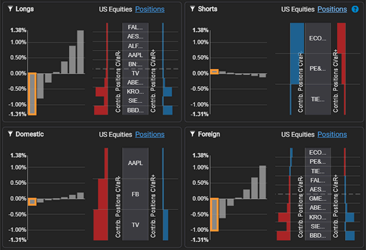 Visualize your portfolio's expected and "tail" P&L under selected exogenous shocks and attribute results to: longs vs. shorts, domestic vs. foreign securities, options vs. non-options and fixed income vs. other securities. Visualize the forward-looking profit and loss (P&L) and tail risks for 2 superimposed portfolios under selected exogenous shocks. Map those changes to specific trades. 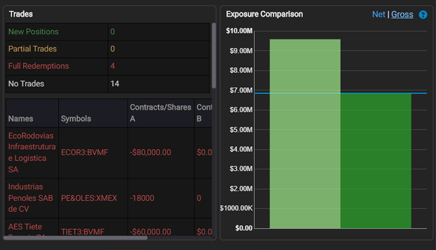 This module helps you visualize delta-adjusted net and gross exposures in the base currency of the portfolio. Quickly evaluate if you are compliant with your mandated exposure. 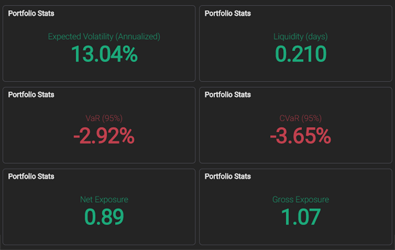 Visually inspect the delta-adjusted net and gross exposures in the base currency of the portfolio, aggregated by: positions, sectors, countries, market capitalization, liquidity, implied rating, duration, dividend yield buckets and user-defined labels. 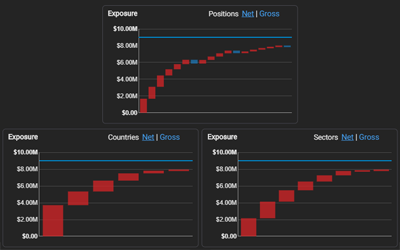 Visualize delta-adjusted net and gross exposures in the base currency of the portfolio, attributed to: longs vs. shorts, domestic vs. foreign securities, non-options vs. options and fixed income vs. other securities. Superimpose the delta-adjusted net and gross exposure from two portfolios in their respective base currencies. Inspect the delta trades between both portfolios. 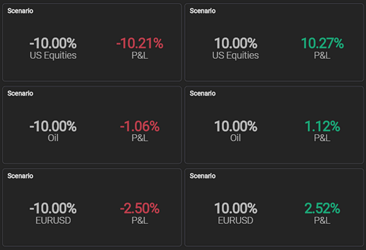 This module generates a historical total return for the portfolio, enabling you to visualize how your current holdings would have performed in the recent past. The backtest automatically takes into account all the daily FX conversions to a base currency. 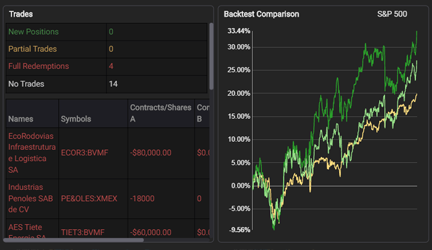 Visualize a pro-forma backtest for the portfolio and a benchmark, side-by-side with various portfolio statistics, such as: Maximum Drawdown, Sharpe Ratio, Sortino, Alpha, Beta and several others. 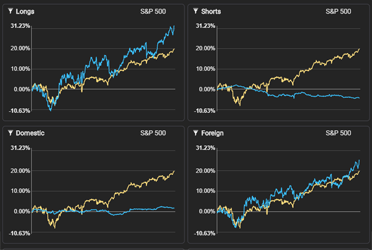 Visualize a pro-forma backtest for the portfolio, isolating the contribution to total return from longs vs. shorts and domestic vs. foreign securities. All the historical currency effects are taken into account. Compare a pro-forma backtest for two superimposed portfolios. Evaluate all trade data between the portfolios. This report can be used with two time snapshots of the same portfolio or with a benchmark. This module provides all the relevant statistical attributes for your portfolio, such as: Predictive volatility, Value-At-Risk, Conditional Value-At-Risk, Liquidity and much more. Ex-ante properties generated from the simulated performance of the portfolio, such as: predictive volatility, risk adjusted liquidity and duration, Conditional Value-at-Risk, Value-at-Risk and others. Statistics generated from the pro-forma performance of the portfolio, such as: realized volatility, Maximum Drawdown, Sharpe Ratio, Sortino Ratio, Alpha, Beta, Correlation, R2 and several others. 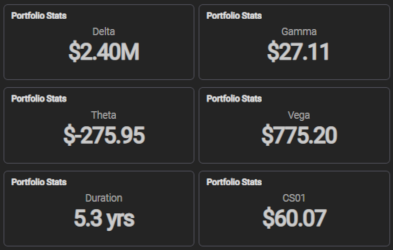 Various sensitivities for options and fixed income securities, such as: Delta, Gamma, Theta, Vega, Notional Duration, Risk-adjusted duration, CS01 and others. Design your own template using a comprehensive selection of widgets. 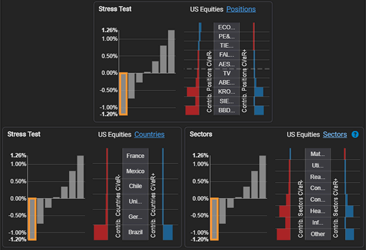 Customize your visualization parameters: shock magnitudes, factor models, benchmark indices and much more. Stacked bars indicating the contributions to risk from different portfolio positions and bottom-up aggregations. Dynamic visualization with portfolio PL&L under various extreme scenarios, including best/worst five positions for each scenario. 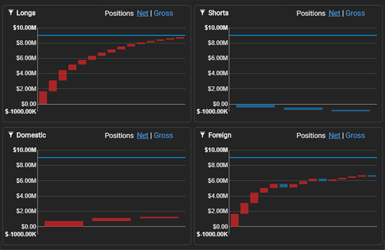 Portfolio-level visualization with expected and tail P&Ls. Stacked bars representing the various systematic risks. 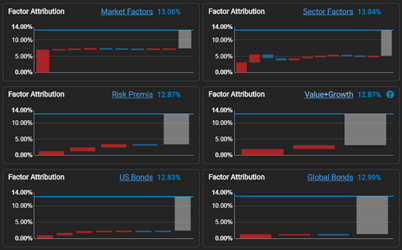 Idiosyncratic risk is always the last grey bar. Stacked bars representing the delta-adjusted exposures from various bottom-up aggregations. Plot with pro-forma back test using current portfolio. Portfolio expected P&L from a historical scenario. Portfolio expected P&L from a prescribed scenario. Rows represent bottom-up risk aggregations and columns are top-down factors. All measures are additive to total portfolio risk. Expected P&L, expected shortfall (CVaR) and right tail P&L for a specific shock. Delta-adjusted exposures from various bottom-up aggregations. 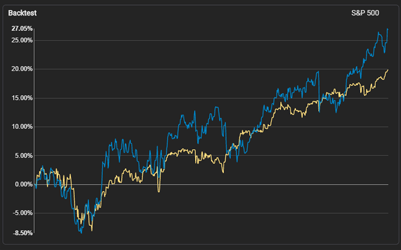 High level comparison of the overall risk from two portfolios. 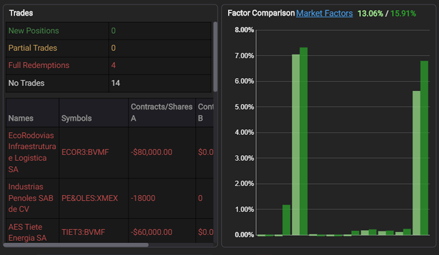 Factor-based comparisons for two portfolios. High level comparison for the overall exposure from two portfolios. Plot with pro-forma back test using two portfolio snapshots. Side-by-side P&L from two portfolios, under various shocks. Any numerical value can be used in this widget, including historical and forecasted properties. Reflects various trades between two portfolio snapshots.